A seismic shift is currently underway in the Toronto real estate market which may have finally pricked Canada’s biggest bubble. In October, home prices plunged at the fastest pace in more than two decades, according to new data published by Statistics Canada. Statistics Canada’s Price Index for new Toronto homes declined 1.4% in October from a year earlier, the most since September 1996. Across all provinces and territories, home prices increased 0.1%, the slowest pace since 2010, which signals the country's real estate market has stalled and could reverse into 2020. The pace of new home construction crashed by a massive 40.3% in the Greater Toronto Area between October 2017 and October 2018. Bloomberg describes the turning point in the real estate market as a result of government measures, introduced in 2017 to help cool the city's red-hot housing market, such as tighter mortgage lending laws. "The Bank of Canada also raised its trend-setting interest rate five times between July 2017 and October of this year," notes Bloomberg. "New home prices were advancing at an annual pace of almost 4% late last year before the mortgage rules took effect." Further, the current economic backdrop suggests storm clouds are gathering across the country. Last week, the Canadian 2 and five year bond yields inverted, for the first time since 2007. "This is often taken as a signal that investors are more optimistic about short-term prospects versus the long term, suggesting a lack of confidence in continued economic growth. This can also impact bank profitability, as banks pay short-term rates on deposits and take in long-term rates on loans. A flat or inverted yield curve, therefore, could lead to negative net interest margins," said Steve Saretsky of VancityCondoGuide. As Saretsky shows, this can cause bank lending to further tighten, leaving borrowers high and dry when market liquidity is most needed. While the resulting slowdown from bank lending can be seen in the decline of sales volumes, it is now more noticeably reflecting in home prices. 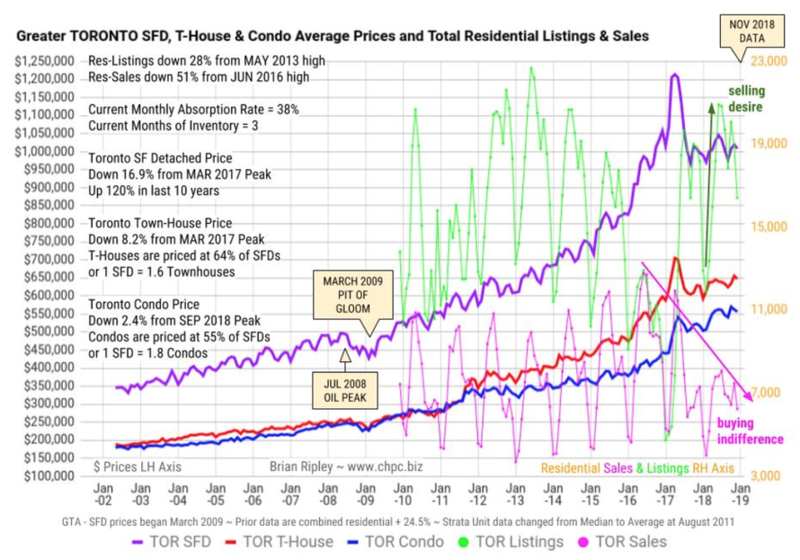 As shown below, Toronto housing sales continued dropping into the lower range of the usual seasonal activity. Inventory has dramatically expanded with listings out-numbering sales by 2.6 times. Rising inventory, declining sales; this market is expected to come under further stress in 2019. Toronto's real estate market is in the midst of a soft landing orchestrated by the government. As the global economy is expected to rapidly slow in 2019, there is a chance the soft landing could turn hard. Storm clouds are here.